possible invasions. Through the communication by river Ayutthaya became not only the trade centre but also the political centre of the kingdom. The artificial canals which connected every part of the capital encouraged the trade. Lopburi. This seems not to have been the case. attempt to denominate the old river tracks. towards Ayutthaya. 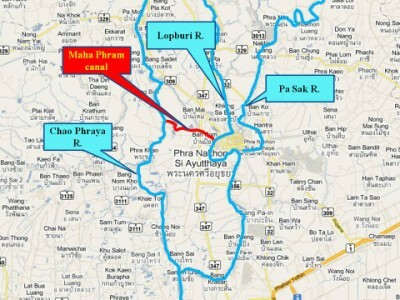 We can thus exclude the Maenam Chao Phraya as one of the rivers surrounding Ayutthaya prior 1767. Everything is changing, everything appears and disappears. not missing on their maps. 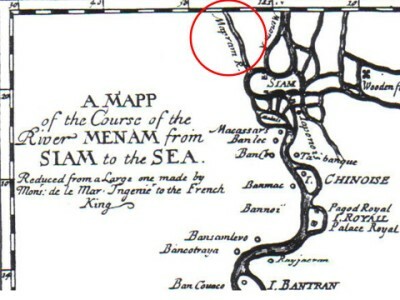 The Maha Phram canal was of course not only of importance to the French at the end of the 17th century. The canal was already longtime prior in existence. travel back and forth to the northern cities. The exact date of its establishment is not known. near the present Makham Riang canal. I discussed this already in an earlier paper. 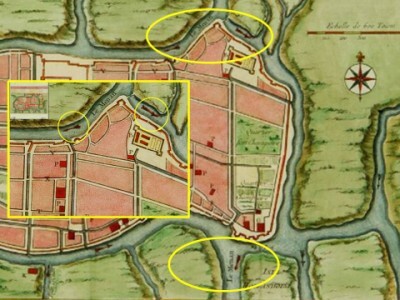 To be clear, the moat dug in 1568, was thus not only widened, but also enlarged on both sides in the period 1570-1580.
years later than what is indicated on the TAT map. 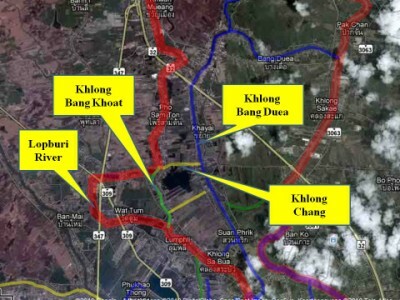 Km east of the city of Ayutthaya. Thus there remain two possibilities. of the city into the old Front city moat or Khu Na Muang. eastern Front city moat (See map of Bellin). 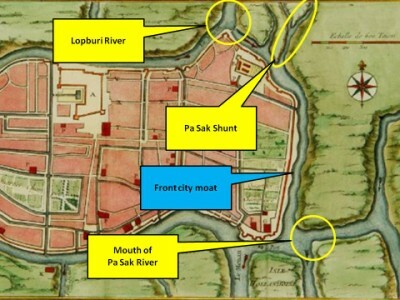 The second possibility is that in 1584, the Pa Sak River was straightened and leaped east of the city in the old Front city moat. river - provided the eastern and the western ring with water. 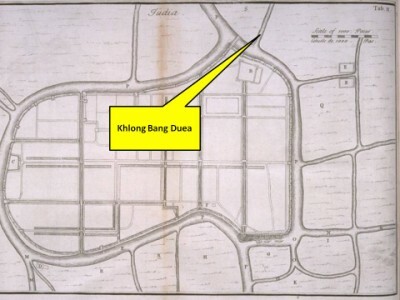 This is an indication that the Lopburi around 1685 was the Khlong Rop Muang of Ayutthaya. called Khlong Sai. 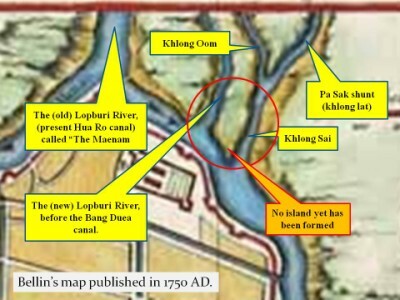 The period of the digging of the Pa Sak shunt must have been situated between 1584 and 1685. Ayutthaya and technically it was still the Lopburi River - surrounding the city - who ran in the Chao Phraya near Bang Sai. mouth at the present Pa Sak River, being the southern end of the former Front city moat). parallel with the old Lopburi River, what will become in the second half of the 20th century the riverbed of the new Lopburi. Khlong Bang Khuat (8). The stretch between Wat Dao Khanong and Wat Muang is sometimes referred to as Khlong Pho Sam Ton. entering the city in the north-east and leaving it in the south, to leap into the Chao Phraya near Bang Sai. Some questions remain unanswered as for example, when exactly the Pa Sak River changed its course and when Ko Chong Lom and Ko Loi were created? 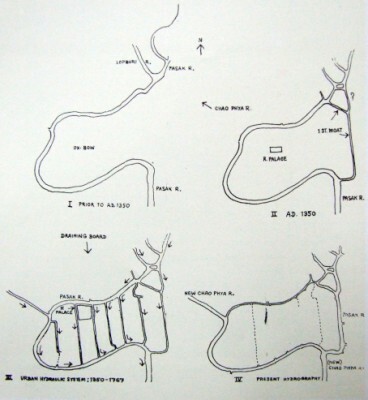 1688) in order to upgrade Siam's fortifications. (2) Near the present location of Wat Hantra. journey from Batavia to Siam. 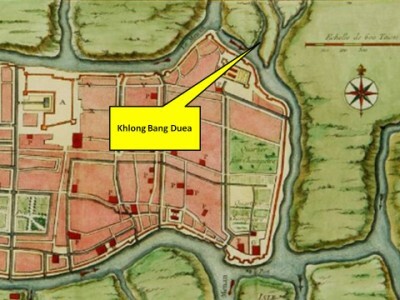 In this work we find a most accurate map of Ayutthaya from his short visit to Siam in 1690. Capitale du Royaume de ce Nom; Levé par un Ingénieur François en 1687” based on sketches made probably by the French engineer Sieur de La Mare. examination, came to the conclusion that it was La Mare who engineered the plan. (5) Th: Oom is translated as "to make a turn". (6) Interview with a village headman near Wat Muang - Bang Pahan in March 2010. (7) Interview with village headman Tambon Khayai on 04 April 2010. 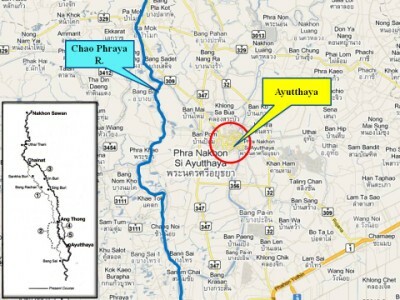 (8) Sources: Administrative map of Ayutthaya & FAD map drafted in 1993. (9) Interview with a Buddhist priest at Wat Dao Khanong - Bang Pahan on 04 April 2010. (10) Interview with a 75 year old local near Wat Pom Raman on 03 April 2010. The Chao Phya: River in Transition - Steve Van Beeck (1994) - Oxford University Press - New York - page 12. 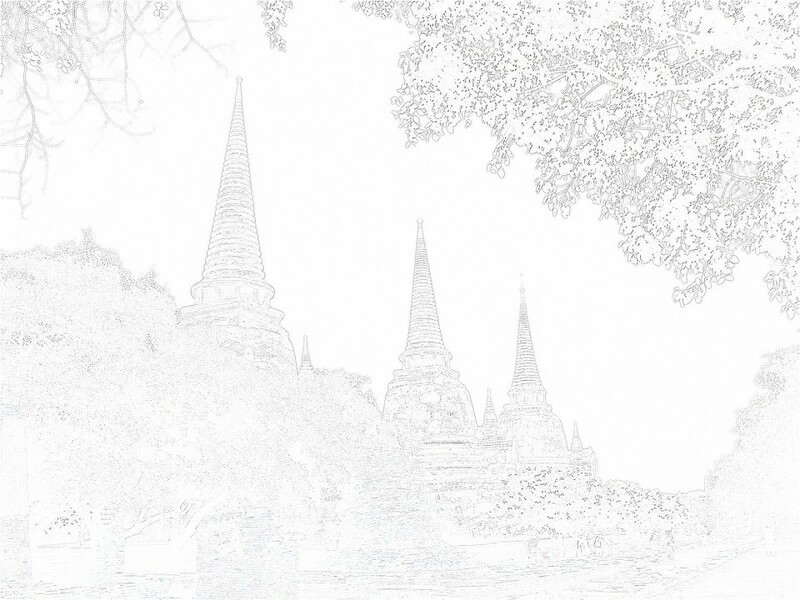 Phra Cakkraphatdiphong & Royal Autograph. Ayutthaya: a world heritage - Tourism Authority of Thailand (2000) - Darnsutha Co Ltd - Bangkok. Our Wars with The Burmese - Prince Damrong Rajanubhab (1917) - White lotus (2000) - Bangkok - War 4 page 51. The Royal Chronicles of Ayutthaya - Richard D. Cushman (2006) - page 82 / Source: Phan Canthanumat & British Museum. Our Wars with The Burmese - Prince Damrong Rajanubhab (1917) - Re-edited White lotus (2000) - Bangkok - War 5 page 66.